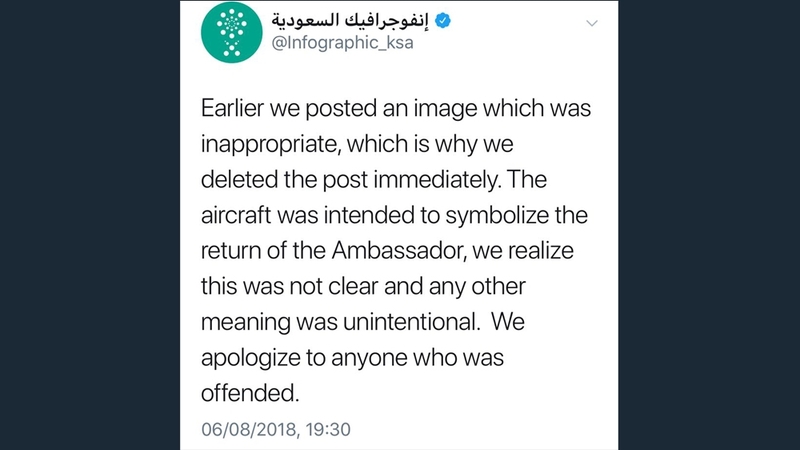 A group in Saudi Arabia apologised and deleted a Twitter post showing an image of an Air Canada passenger plane veering towards Toronto’s tallest skyscraper with a warning against meddling in others’ affairs. Some on social media noted the image was reminiscent of scenes during the September 11, 2001, attacks on the United States, when nearly 3,000 people were killed by 19 hijackers – 15 of whom were Saudi nationals – who flew airliners into the World Trade Center’s twin towers and the Pentagon. The controversial tweet came amid an escalating diplomatic dispute between Canada and Saudi Arabia after Ottawa denounced Rihadh’s imprisonment of human rights activists. The infographic also accused Canada of “sticking one’s nose where it doesn’t belong”. The group later apologised for the “inappropriate” post and said the image was meant to symbolise the return of Canada’s Ambassador Dennis Horak, who was ordered to leave the kingdom within 24 hours on Monday over the diplomatic spat. After Ottawa’s criticism, Saudi Arabia also froze new trade and investment with Canada worth billions of dollars and ordered 15,000 Saudi students not to attend Canadian universities. Al Jazeera contacted Canada’s Ministry of Foreign Affairs for comment about the tweet but at the time of publication had not received a response. Saudi Arabia has always denied any involvement in the 9/11 attacks, which sparked the “global war on terror” that led to the invasions of Afghanistan and Iraq. Evidence submitted as part of a class action lawsuit against Saudi Arabia last year alleged Saudi’s embassy in Washington, DC, may have funded a test run for the deadly attacks. Last year, the kingdom urged its citizens to report subversive comments found on social media via a phone app, a move denounced by Human Rights Watch as “Orwellian”. According to the watchdog, more than a dozen female activists have been targeted by Saudi authorities since May, in what was described as an “unrelenting crackdown on the women’s rights movement”. Crown Prince Mohammed bin Salman, heir to the Saudi throne, has become the ultimate decision-maker for the kingdom’s military, foreign, economic and social policies, championing his Vision 2030 plan that includes subsidy cuts, tax increases, state-asset sales, a government efficiency drive, and efforts to spur foreign investment. But the crown prince’s actions have caused some resentment in Saudi Arabia and the wider Middle East over high unemployment, the ongoing war in Yemen, the illegal blockade of Qatar, and fears Riyadh is looking to normalise diplomatic relations with Israel.